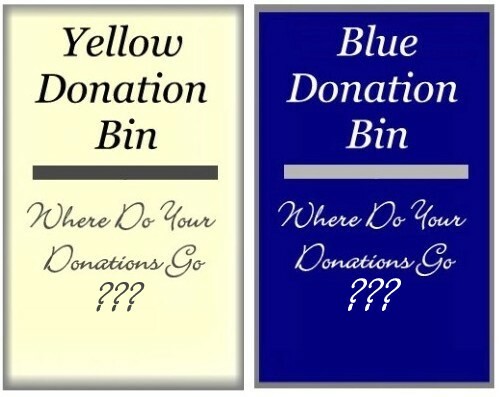 Which bin to choose, Yellow or Blue? You have probably noticed them lately, those big yellow bins which collect used clothing are popping up all over the county with the name Planet Aid written on the side of each bin. One might think that donating clothing into those bins would support a charity that was doing good for poor people in the world, but an Internet investigation of the Planet Aid organization reveals something quite the opposite. According to Fox News, the Danish government had tried to shut Pederson’s operations down but he eluded the law for years and has a well-developed organization that has managed to continue the widespread deployment of these yellow Planet Aid boxes. In the past year, more than a dozen of these collection boxes have been placed across Burke County. And the sad part of it is it is siphoning much-needed clothing away from Burke County citizens and their families, and helping the underemployed and unemployed in this county is our primary concern. If this violates your sense of justice the way it violates ours, the best response you can make to these yellow boxes, is to tell your friends that this is an organization that does absolutely nothing for Burke County and our neighbors. We encourage you to redirect your charitable clothes giving to the BUCM clothing ministry. We live in a county where the number of unemployed and the number of underemployed people who are living on part-time wages and no benefits is almost 30 percent of the population of Burke County. Each year, hundreds of clients and families are clothed by making very low-cost purchases at the used clothing store at BUCM. Burke United Christian Ministries operates the Saved for You Clothing Store and Clothing Closet. It serves as a source of clothing for those who are identified as being in crisis. It also functions as a retail store and is open to the public, where community members can make low cost purchases for their clothing needs. All proceeds from clothing sales are used to support our crisis ministry. Instead of donating to the Planet Aid organization, in the big yellow containers, where proceeds benefit Mr. Pederson; donate to BUCM where all clothing benefits the families in our community. No one at BUCM profits from any items or funds donated to our organization. Items that we need now would include: new underwear in packaging, men’s jeans, blankets, sleeping bags, shoes in all sizes, backpacks, infant and toddler clothing, and tarps. All donations are accepted Monday through Friday from 8:30 a.m. until 4 p.m. and Saturdays from 9 a.m. until12:30 p.m. “Whatever you do for the least of these, you have done for me also.” Matthew 25. BUCM is able and willing to accept all clothing donations. The items donated can be worn and tattered clothing; BUCM accepts them. By donating these items, BUCM is able to receive funding. These funds, in turn, go to support and sustain the mission and vision of BUCM serving all residents of Burke County who fall below the poverty income threshold. Please understand that donations are accepted throughout the year. Burke United Christian Ministries makes a real difference in the lives of our neighbors in Burke County every day, helping those beneath the poverty level to provide for the basic human needs of their families while maintaining their dignity as human beings. That is why we, members of the Board of Directors of Burke United Christian Ministries, work as volunteers to support the vital and ongoing ministries of BUCM. We invite you to think and act locally with your donations to BUCM, especially your clothing contributions. You will be impacting the lives of your neighbors. Thank you in advance for donating to a local organization that desires to help and serve the entire community.